BMW and European Sport Sedan lovers, check out this gorgeous 2008 BMW 535xi sedan in ‘sterling silver.’ This large sedan is equipped with a 3.0L L6 DOHC 24V . engine hooked to a smooth shifting automatic transmission. Not into performance? Then this 535xi sedan is just a lot of fun to drive. The exterior and interior show as immaculate. The easy tuning sound system provides excellent reproduction for your collection of compact discs, or FM listening. This BMW can seat five passengers, comfortably. Only 78k miles on the odometer, with many more safe and carefree miles remaining. STATE INSPECTED, ONE OWNER, SMOKEFREE, AUTOCHECK ASSURED with NO ACCIDENT HISTORY. Freedom Wheels low price is only $8,595. Ideal vehicle for the individual or couple that prefer a large, luxury European vehicle. 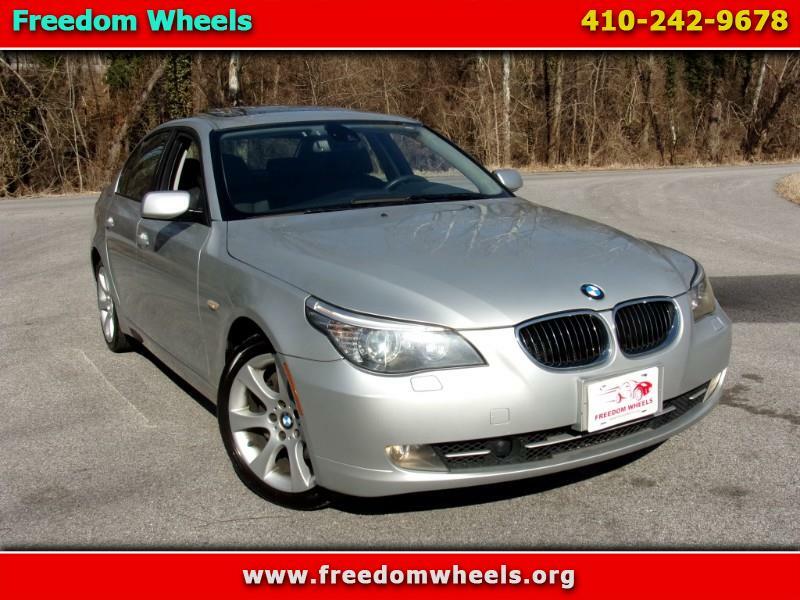 Quickly, call 410.242.9678 for more information or to arrange a test drive. Sales tax and registration additional.